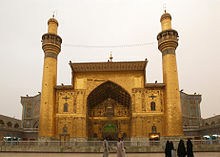 Shi'a Islam (Arabic: شيعة‎, Persian: شیعه‎) is the second largest branch of Islam. Shia Muslims believe that Prophet Muhammad under the command of God chose Ali as Caliph (or Successor) and publicly declared it, in his last sermon after Hajj at Ghadeer Khumm. Shi'a Muslims believe in the teachings of the Qu'ran and the Prophet Muhammad's family, whom they call the Ahl al-Bayt. The Shias think that the first three ruling Sunni Caliphs had no importance to the development of the faith. The singular/adjective form is Shī'ī (شيعي) and means a follower. Shi'a Islam, like Sunni Islam, has at times been divided into many branches, however only three of these have a significant number of followers nowadays. The best known and the one with most adherents is Twelvers (Ithnā 'ashariyya), followed by the Ismaili and Zaidiyyah. Wikimedia Commons has media related to Shi'a Islam. This page was last changed on 11 February 2019, at 03:59.